Last week I went to the copier to grab something early in the morning and saw this. I didn’t look at any other pages because I just couldn’t do it. Instead I whined on twitter. Not the most useful decision, I know. 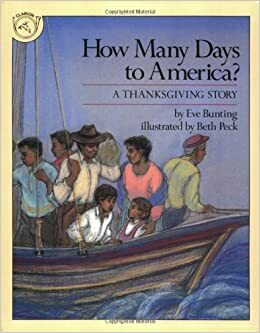 But the responses on twitter helped me calm down (and shared some great resources).This week I only have two days with my students but we’ll continue our conversations about gratitude and read Eve Bunting’s How Many Days to America?, my favorite book about Thanksgiving. It’s a story of refugees fleeing danger and making a dangerous journey to the United States, told from the perspective of a child. 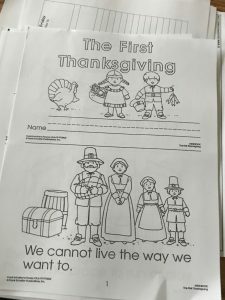 As I’ve been thinking about how Thanksgiving Day is so often approached and taught in elementary schools I did a quick search, using the terms, “Thanksgiving activities elementary school”. Here was some of the first page results. It seems to me, based on this tiny bit of research, that more teachers are taking the route I tend to take, which is to ignore the historical piece of Thanksgiving and focus on the idea of gratitude and the current cultural aspects of the holiday. I can live with that. It’s far better than what I’ve seen for many years. However, there are still plenty of classrooms in which students are making Pilgrim hats and feathered headdresses. Too many classrooms in which students are only learning about native people as historical figures, with no sense of native people in our country today. Too many classrooms in which students are learning about white people treating native people with kindness and welcoming them. Too many classrooms with wildly historically inaccurate lessons. And not just historically inaccurate, but historically harmful. So it may be time for me to stop ignoring the historical piece of Thanksgiving and address it head on. It may be time for me to plan some critical literacy lessons around Thanksgiving for my students. Some images and texts that we can analyze and question and begin to build a better understanding of what Thanksgiving means in this country. Who it presents and how it presents them. Why we understand it the way we do. I want my students to understand that history is often told by those who have power and privilege and, as a result, history is not always fully accurate. Too many adults don’t realize and understand this. Too many elementary school teachers don’t. Or they are willfully ignorant when it comes to teaching our history, especially when it includes people of color.